Rare bookseller Stuart Bennett delivers yet another delightfully bookish novel with Lord Moira’s Echo, a follow-up, if not exactly a sequel, to his 2012 novel, A Perfect Visit. That novel, as some of you will recall, told the tale of an American librarian and a Canadian graduate student who became involved in a time-travel experiment. The student, Vanessa Horwood, traveled to Jane Austen’s England, only to become trapped there when she is erroneously jailed for forgery. All is not lost for Horwood because she does become friendly with Austen, but at the end of A Perfect Visit she is indeed stranded in 1817. Lord Moira’s Echo (Longbourn Press, 14.95) opens in 1823. Vanessa has made a new life in Bath, and apart from a few references to her possible “rescue,” Bennett’s second novel has a more defined historical narrative. He takes up Austen’s “lost” years, 1801-1804, for which primary sources cease to exist. It has long been rumored that Austen fell in love during these years, and Bennett uses historical evidence (and imagination) to pin her to Francis Rawdon-Hastings, second Earl of Moira and later Marquess of Hastings. Two tales intertwine in Lord Moira’s Echo--that of Jane’s 1801-1802 affair with the earl, and of Vanessa’s discovery of it in 1823. Austen family intrigues, the Prince Regent’s insatiable greed, and a kidnapping all do their part to further the plot. Bennett’s ease with dialogue and his ability to convey historical events--without beating us over the head with it--are commendable. Yes, there is a plethora of fiction out there featuring Jane Austen--and, no doubt, more to come--but “Janeites” will find shelf space for the best of them, including both of Bennett’s novels. Rare bookseller Stuart Bennett delivers yet another delightfully bookish novel with Lord Moira's Echo, a follow-up, if not exactly a sequel, to his 2012 novel, A Perfect Visit. That novel, as some of you will recall, told the tale of an American librarian and a Canadian graduate student who became involved in a time-travel experiment. The student, Vanessa Horwood, traveled to Jane Austen's England, only to become trapped there when she is erroneously jailed for forgery. All is not lost for Horwood because she does become friendly with Austen, but at the end of A Perfect Visit she is indeed stranded in 1817. Lord Moira's Echo (Longbourn Press, 14.95) opens in 1823. Vanessa has made a new life in Bath, and apart from a few references to her possible "rescue," Bennett's second novel has a more defined historical narrative. He takes up Austen's "lost" years, 1801-1804, for which primary sources cease to exist. It has long been rumored that Austen fell in love during these years, and Bennett uses historical evidence (and imagination) to pin her to Francis Rawdon-Hastings, second Earl of Moira and later Marquess of Hastings. Two tales intertwine in Lord Moira's Echo--that of Jane's 1801-1802 affair with the earl, and of Vanessa's discovery of it in 1823. Austen family intrigues, the Prince Regent's insatiable greed, and a kidnapping all do their part to further the plot. Bennett's ease with dialogue and his ability to convey historical events--without beating us over the head with it--are commendable. 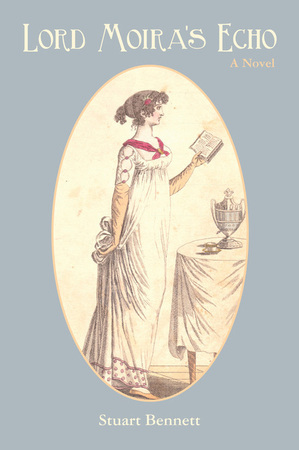 Yes, there is a plethora of fiction out there featuring Jane Austen--and, no doubt, more to come--but "Janeites" will find shelf space for the best of them, including both of Bennett's novels.